Dr Lindsay Bell, Principal Research Scientist with CSIRO Agriculture and Food, presented some of the preliminary data from the GRDC-funded project at Incitec Pivot Fertilisers’ Agronomy Community forum earlier this year in Brisbane. “Farmers have a whole range of levers at their disposal to influence how efficiently the system can convert rainfall into product and dollars,” said Dr Bell. The project is comparing 38 different farming systems, with variations in cropping intensity, crop choice, nutrient application strategies and other interventions such as the use of cover crops or manure. Dr Bell emphasised that the site at Pampas, east of Toowoomba, was very fertile at establishment, with high soil phosphorus and potassium levels. Based on the data collected in the first three and a half years, he shared five key insights around crop nutrition with the Agronomy Community. “We are seeing big differences in the nutrient cycling between different crops in terms of the amounts being accumulated in fallow and the timing of that nitrogen availability,” he said. Soil tests were taken in April and September 2016 to track soil nitrogen accumulations following wheat, faba beans, chickpeas, field peas and canola grown in 2015. Soil nitrogen accumulation was much higher after canola and legumes than after wheat. The soil rapidly offered up 84 kg/ha of nitrogen after canola, while only 21 kg/ha of nitrogen showed up in the fallow after wheat, in tests taken in April 2016. By September, the fallow nitrogen accumulation was still significantly higher where field peas and canola had been grown, with 130 kg/ha of nitrogen accumulated. In other crops, faba beans and chickpeas had accumulated approximately 90 kg/ha of nitrogen and the fallow following wheat accumulated 60 kg/ha of nitrogen. “This understanding is helpful if you’re designing a system that can capture the nitrogen from crops with a higher rate of nitrogen cycling,” he said. But it wasn’t all good news from legume crops, with the pulses in the system utilising soil nitrogen before fixing atmospheric nitrogen. “The nitrogen exported in grain from legumes exceeds that of wheat,” said Dr Bell. “Any additional nitrogen fixed is often being exported from the system so that we achieved a similar negative nitrogen balance after the pulses to cereal dominated rotations. He added that legumes were also likely to be exporting more of other nutrients than expected. “Grain testing has shown the legumes are removing a lot of phosphorus and potassium,” he said. For example, in faba beans, 10 kilograms of potassium was removed in every tonne of beans at harvest, which was three times that of wheat. Phosphorus was removed at nearly twice the rate of wheat. “Quantifying the nutrients removed with the harvest can greatly inform future decision making in terms of replenishing those nutrients,” said Dr Bell. 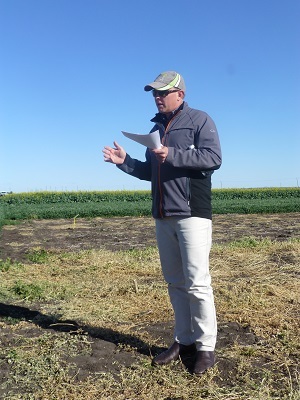 He encouraged growers to use grain testing to close the loop on nutrient budgeting. Incitec Pivot Fertilisers’ sub-tropical farming systems agronomist, Bede O’Mara, has also seen high potassium removal from chickpeas when grain testing his field trials. “The grain test results showed that one tonne of chickpeas removed 10.7 kg of potassium – nearly three times more than one tonne of wheat at 3.7 kg,” Mr O’Mara said. The Nutrient Advantage® laboratory offers grain testing along with soil and plant tissue testing to provide answers to growers and their advisers. The farming systems research is also comparing higher intensity farming systems (e.g. five crops in three years) with lower intensity farming systems (e.g. three crops in three years). “We’ve added more nitrogen into the high intensity systems, but we haven’t produced a lot more grain in total than the lower intensity ones,” Dr Bell said. His final insight came from a comparison of two fertilisation strategies, one designed to support a 90th percentile yield and the other a 50th percentile yield. “In those systems with a higher fertiliser strategy, we’ve essentially balanced removal with supply so far, but we haven’t seen much in the way of a yield response,” he said. Dr Lindsay Bell, Principal Research Scientist with CSIRO Agriculture and Food, at the GRDC-funded farming systems research project on the Darling Downs. He shared five key nutrient stories from the farming systems site with agronomists at Incitec Pivot Fertilisers’ Agronomy Community forum in Brisbane. He said the farming systems project is showing the value of maintaining a consistent approach which balances nutrition across the whole rotation. Dr Bell sees similarities with Incitec Pivot Fertilisers’ long-term nutrition research at Colonsay, where nitrogen and phosphorus applied to each crop at 80 kg/ha and 10 kg/ha respectively is keeping the system in nutrient balance after 33 years. Mr O’Mara said although some individual crops removed more than these rates, the overall system was balanced in the long term at these levels. “The economic analysis from Colonsay suggests that the best long-term returns are achieved by using nitrogen and phosphorus together, but they are only positive when nitrogen is optimised at 80 or 120 kg/ha,” he said. The GRDC farming systems research project is continuing. Findings will be available on completion.